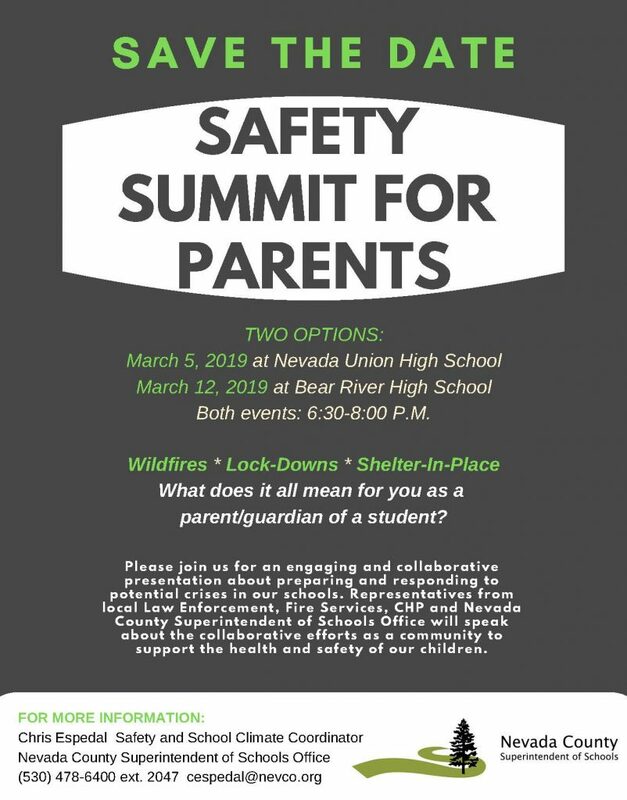 The Nevada County Superintendent of Schools Office is hosting two upcoming Safety Summits for parents and guardians of local students. Learn how the Superintendent’s Office collaborates with first responders to prepare for and respond to crises in our schools. This engaging presentation will include representatives from local law enforcement, fire services, and the California Highway Patrol. The panel will address issues such as wildfires, lockdowns, and shelter-in-place procedures. For more information, contact Safety and School Climate Coordinator Chris Espedal by phone at 530-478-6400 ext. 2047 or by email at cespedal@nevco.org.